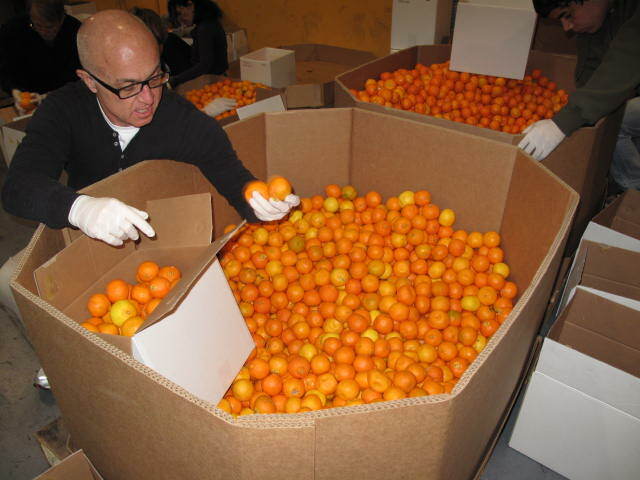 Many people are surprised to learn that winter is prime harvest time for many types of citrus. One look into our warehouse right now illustrates that season nicely. Our pantry orders are stocked with gorgeous citrus fruit! Among the prime deliveries are easy-to-peel mandarin orange “cuties”, which are perfect for kids’ snacks at schools and after-school programs since they don’t require an adult to slice them. In addition to the cuties, we have a good assortment of other hand-held fruit such as pears and apples. More than half of all of the food we distribute is fresh produce. Even through seasonal fluctuations, we work hard to keep our orders balanced. Barbara Abbott, our Food Resources Manager explains, “We have a variety of winter vegetables right now – winter squash, potatoes onions, sweet potatoes, cauliflower, celery and carrots.” Every Monday this month we will also receive a full truckload of lettuce products and fully prepped cut vegetables from Yuma County. This month, we also received three truckloads of purchased bulk oats, pinto beans and black beans which our volunteers will package into 1lb easy-to-transport bags for our program participants. We are excited to provide people in need nutritious foods year-round, and work hard to make sure there are staples and produce available each month, no matter the season. Cook vegetables separately in water until tender; drain. Melt butter; stir in remaining ingredients. Combine the vegetables and butter mixture; toss to coat. Yield: 10-12 servings.